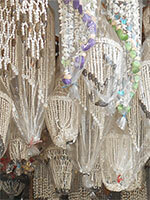 Spiral shell chandeliers from Bali Indonesia. 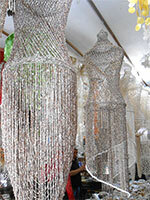 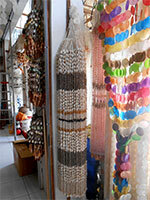 Hanging windchimes made of lightweight capiz shells. 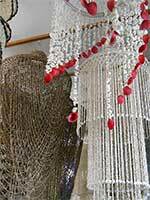 Suitable to decorate your room or house with beach nautical theme. 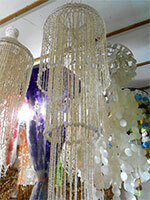 These white shell chandeliers also available sea shell curtains made of a mix of white shells and brown shells. 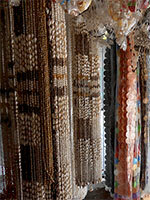 All shells here are easily found on the beaches of Indonesia, including in Bali and Java. 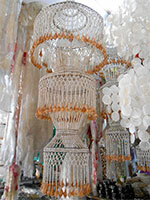 All shell crafts here are made by hand entirely, with very simple tools. 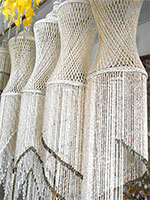 Each piece is unique and good quality, suitable for export market. 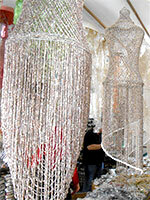 Contact us for further information regarding these shell chandeliers. 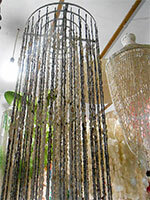 Remember to view our catalog for Sea Shell Hanging Decors.We have also white sea shell lamps from Bali Indonesia. 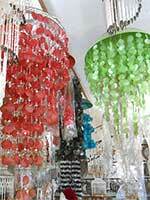 Sea Shell Chandelier Bali Indonesia.